As the 50th anniversary of the March on Washington approaches, Dr. Martin Luther King’s “dream” remains unfulfilled. Great progress has been made against racial discrimination, but Dr. King’s call for economic justice remains unanswered. In the 50 years since King at the Lincoln Memorial called attention to the “promissory note” to people of color that had come back marked “insufficient funds,” America has still not made good on that note. King understood that a full employment economy is a prerequisite for economic justice. That goal seems more distant now than 50 years ago. A renewed movement demanding full employment is now more crucial than ever in the face of the growing chorus of conservative ideologues, academics and Beltway pundits that says we should settle for a “new normal” of historically high unemployment. In one of his most quoted speeches, his August 16, 1967 address, “Where Do We Go From Here?,” King made the full-employment demand explicit. This is a human catastrophe and a moral outrage, but increasingly the Washington establishment greets it with a collective shrug. We are told that the forces of globalization are inexorable, that the days of even modestly-skilled workers being able to obtain jobs that pay enough to support a family and build wealth are long gone, and that it is folly to use government as a tool to put people to work. Conservatives have never hid their antipathy for a little-appreciated but critically important law, pushed through Congress by the late Sen. Hubert Humphrey and the pioneering Congressional Black Caucus member Rep. Augustus Hawkins, that requires the Federal Reserve to consider the impact of monetary policy on unemployment as well as on inflation. While the Humphrey-Hawkins Full Employment Act falls short of requiring specific actions to keep unemployment low, it requires the Fed to publicly account for the impact of its actions on people looking for work. That law only came into being as a result of sustained campaigning by the Black Caucus, civil rights leaders and other progressives. One of the veterans of that fight, Rep. John Conyers, D-Mich., now has a bill before Congress, “The Humphrey-Hawkins Full Employment and Training Act,” which would translate the vision of the earlier Humphrey-Hawkins bill, and what King articulated in his speeches, into concrete policy. The bill would put people to work in a broad range of full-time public- and nonprofit-sector jobs, and would also provide robust funding for job-training and workforce-development programs. Conyers would pay for the program through a transaction tax on Wall Street stock trades. But it could also be paid for by eliminating tax breaks to multinational corporations, such as tax incentives that encourage multinationals to move jobs overseas. It is astounding that only 42 members of the House have co-sponsored this bill. If nothing else, the essential principle of full employment should be a rallying point for any member, or any party, seeking to be viewed as standing on the side of financially struggling individuals and families – and against those who pay fealty to “job creators” while devaluing workers. But, as Frederick Douglass said and as King demonstrated, power concedes nothing without a demand, and even our erstwhile allies in Congress will not take up the rallying cry of full employment without a movement demanding that they do so. One thing is clear: The 20 million people who are either unemployed or working part-time because they cannot find full-time work need no lectures about the fierce urgency of now when it comes to making jobs a top priority. Yet Washington is gearing up for a budget showdown with the conservative Republican House majority demanding another round of job-killing spending cuts. Continuing the federal spending sequester will cost the economy an estimated 900,000 jobs over the next 13 months, according to a July Congressional Budget Office memo. It will also cripple the country’s ability to address the continuing injustice of an African-American unemployment rate that remains double that of whites. 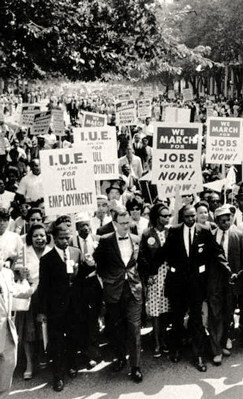 The 1963 March on Washington was a march for both jobs and justice. Now, on its 50th anniversary, renewing the fight for full employment remains one of the most important ways we can honor Dr. King’s dream.